In simple, easy to manage steps, with lots of practical examples, and backed up by scientific research Cathy shows how we can all let go of anger and negative thoughts to achieve lasting happiness and contentment. "Regardless of how contented or happy you feel with your life, you will find some useful tips and advice… in Cathy Glass's new book. " "Cathy's sequel to Happy Kids is culminated through her insightful observations of what makes Adults happy and snippets of fascinating stories from people's lives mixed in with her common sense philosophy on life. " "An easy to read yet hard hitting book. While some may think the 'take responsibility' view is hard it is delivered with care, sensitivity and understanding. Full of positive advice yet …this is warm and friendly, not clinical and cold. A book for everyone: if you just want an emotional boost and pat on the back, or you need help to realise your potential this book is the one to read. " 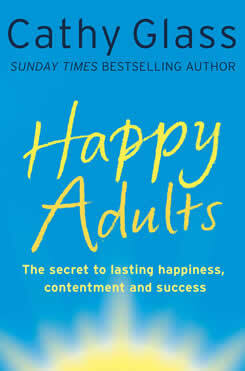 "Happy Adults was a good read, concise and to the point. " "A great book, I can relate to. It has helped me a lot. I too bottle things up and get depressed - about job hunting. I can now find a new way to deal with it. Thank you so much, Cathy. " "… at last a common sense approach in words we can all understand. I can think of a number of people who will be getting a gift of this book in the near future, so I will have to get an extra copy for myself. Thank you, I am smiling, I O it 2 me. " "Author Cathy Glass best known for her memoirs and advice on raising happy children, takes her 25 years as a foster parent and comes up with a brilliant yet straight self help guide to becoming a “Happy Adult.”...Happy Adults is a must read for all and will have even the most headstrong person re-evaluating and wanting to change aspects of their lives." "An engrossing read and, as always, Cathy Glass speaks a lot of sense."